Next up is Bill Morrison’s Veterans Day tale. This one is serious in nature and follows a group of military men on the night of Orson Welles’ famous War of the Worlds radio show that fooled the world. They take on a group of invading Martians and show the true fighting spirit of the American soldier. Then comes Alan Boothby’s Thanksgiving story. Heavy on humor, it’s the story of an attack by Martians on the Macy’s Thanksgiving Day Parade, and the secret weapon that New York City has at its disposal to fend off the invading aliens. Finally, Dean Haspiel gives us a Christmas yarn that’s a heart breaker. It’s definitely entertaining and a good read, but it’s not your average Christmas pick me up kind of story. On the art side of the book, it’s a lot of good stuff. You start off with Fred Hembeck, who’s awesome as usual. Next you move on to Bill Morrison and Tone Rodriguez‘s Veterans Day story which is a complete 180, and it needs to be. It’s more serious in tone and that’s what the story needs. Great realistic, highly detailed art. The third story is done by Alan Robinson and is more on the goofier side. It’s got some KILLER likenesses of celebrities that are pretty spot on. Very entertaining and kinetic. Last, you have Dean Haspiel and his Christmas tale. Some REALLY nice art here, but what makes it is the tone and colors by Allen Passalaqua. They totally make this story. 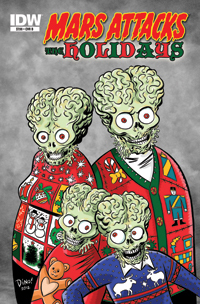 Mars Attacks The Holidays is a really nice read. Very entertaining, touching, heartwarming, and fun. Just like the holidays themselves. Pick this one up, you’re gonna enjoy it!